Rogers BlackBerry Bold 9700 Launch Approaching Fast! We've been hearing some rumors for a few days regarding Rogers BlackBerry Bold 9700 release. Finally, it seems they are rumors now more. 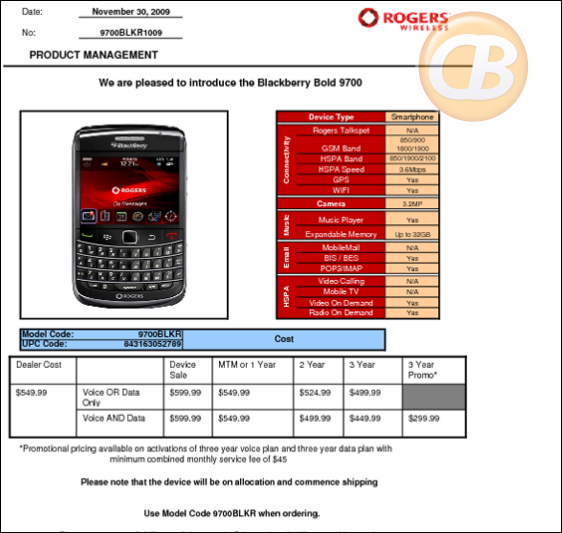 Rogers has sent off the emails to CSR's telling them to take the BlackBerry Bold 9700 training courses in the Rogers Fastrack system, while Rogers BlackBerry Tech agents have already been trained up. We were also hearing that the devices were sitting in the warehouse, flashed with the latest 5.0 OS and all packaged up for Rogers customers across Canada. All of this is now confirmed. All that's really left right now is for dealers to place their orders and get them shipped off to retail locations. Shipping will be available from November 2nd and with some retailers receiving their devices possibly as soon as November 4th. The final rumor that has been passed around is that Rogers is planning on doing a soft launch of the device and while this still remains a rumor until some are actually sold, retailers will have the devices on hand and they're already in the system to be processed. And of course, Rogers may want to be getting ahead of Bell in the sales department if even just by a day or two. So, who's excited for the Bold 9700 now? Gonna be hitting up your local Rogers location to grab one of these?